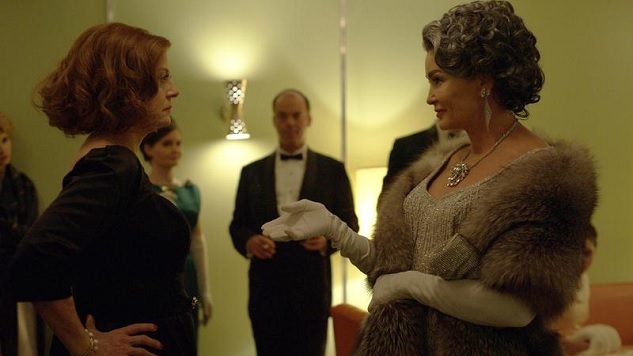 “Imitation is the sincerest form of flattery,” goes the old bromide, but they hadn’t seen Ryan Murphy’s Feud: Bette and Joan way back in the 19th century; if they had, they might have packaged that oft-spoken bit of wisdom with a few provisions with regard to details like taste and propriety, or they might have retracted it entirely. There’s much to recommend about Murphy’s latest FX series—the sets, the costuming, and Susan Sarandon’s remarkable, exciting, thoroughly empathetic portrayal of Bette Davis, just to name a handful—but it’s difficult to watch Feud without noticing just how indelicately it toes the line between mimicry and mockery. Of course, you could make the exact same remark about any TV show, or any film for that matter, whose basic conceit is informed by period reenactment; bringing history to life, whether it’s history your audience has lived through or not, is no easy feat, an illusion more susceptible to self-unraveling than most workaday examples of fiction. We hold onto preconceptions about what the world is supposed to look like through the lens of visual media. We’re biased in favor of our own points of view. Feud, and stories like it, make a gamble just by being. But in the biopic categories, there are safe gambles and foolish ones, and Feud is the latter. It’s likely a safe assumption, or a safe enough assumption, that a sizable chunk of Feud’s audience is composed of youngins, people who weren’t there for the notorious clash between its two leading characters, Joan Crawford and Bette Davis; if they were, there are good odds they weren’t cognizant of it, unless they were raised by parents who thought What Ever Happened to Baby Jane? was good, wholesome kids’ entertainment. That demographic wasn’t alive in the 1960s, for Davis’ Oscar snub and Crawford’s stand-in acceptance of Anne Bancroft’s award, for the licentious, shameless gossiping bandied about in the trades regarding their brewing enmity for one another, or for the theatrical release of What Ever Happened to Baby Jane? itself, which is as important to the series as the actual feud. Except who cares? You don’t need to have lived through the heydays of Crawford and Davis to check a copy of What Ever Happened to Baby Jane? out from your local library or your favorite DVD rental service. You don’t need to have been there for the 1963 Oscar ceremony to read about it, to engage primary and secondary sources to fill you in on what you missed. You just need a Blu-ray player and enough research savvy to educate yourself on the relevant facts, and once you’ve done both, Feud starts to look and sound and feel an awful lot like reason for chagrin. Davis would probably approve of Sarandon’s performance and Murphy’s writing, but can you imagine Crawford giving Jessica Lange a thumbs up for depicting her as sad, cripplingly lonely, overly reliant on drink and on Mamacita (Jackie Hoffman) and, quite frankly, a petty narcissist? It’s possible she was all of those things, and it’s also possible that Davis wasn’t all of the things that Sarandon finds in her performance. (Aside: This seems unlikely. Look, rumors are rumors, but if you put any stock in the Davis legend, then you know that she could strike fear into the heart of a high-powered movie executive just by showing up at his door. She was a titan.) What’s more of a snag isn’t so much the interpretation of the people, but of the product, because re-enacting not only the relationship between two of the greatest movie stars of their time, but also the movie that brought them together on the big screen, means replicating the movie as well as the stars themselves. We can argue over whether or not Sarandon and Lange “get” their roles. We can’t argue for anywhere near as long over whether or not Feud “gets” What Ever Happened to Baby Jane? If playing a real person in a piece of visual media is a challenge, then doing the same for the media itself is downright Herculean. People are mutable. Media, from the cinema to television, is indifferent. It doesn’t care how hard you try to recreate it or duplicate it; the original is there, always, ever present as the mirror that shows the reproduction its shortcomings. Sarandon and Lange are both institutions unto themselves, not that unlike Davis and Crawford, but Murphy is no Robert Aldrich, and so when Feud must remake scenes in What Ever Happened to Baby Jane?, it unintentionally shows itself up. In a vacuum, this would only reflect upon Murphy’s skills as a mime. In the series, it winds up revealing the seams of everyone else’s work, too, calling into question not only the quality of Murphy’s craft but the craft of his two principal actresses. Every time Feud presents a forgery of What Ever Happened to Baby Jane?, we’re reminded instantly that we’re watching a fake. Good as Sarandon and Lange are, they just can’t match Davis and Crawford in the context of their performances; it’s one thing to resurrect or invoke an actor’s persona and iconography in a television series or in a movie, and another thing entirely to effectively capture that actor at work. You can comment on the person, but you can’t comment on their work. You certainly can’t improve on it, and good luck trying to equal it. At a certain point, we start to wonder if what Sarandon and Lange do with their screen time should be called acting or impersonation; the difference between these is minimal when playing a real and knowable human being, be they alive or dead. Feud isn’t the first production to make a go at this kind of stunt. It isn’t even the first Murphy production to do so. Just last year, The People v. O.J. Simpson: American Crime Story dropped jaws by doing the exact same thing as Feud, but with the benefit of firmer primary sources. (It also helps that the O.J. Simpson murder case isn’t a Hollywood yarn, because we all know that people in Tinseltown love to spin a tale almost as much as they love to embellish it.) Move out of television and into the theaters and we find Jackie, the story of Jacqueline Kennedy and the many faces she wore as both the wife and the widow of John F. Kennedy. As different as each of these is from the others in specifics, they’re all linked by one common thread: They have to pass the smell test. By their very nature, they must satisfy the viewer’s notions of who the characters are supposed to be, and imposed with such restrictions, they each must work doubly hard to meet expectations. Maybe Davis and Crawford would be flattered by Feud, to see themselves introduced to a new generation of devotees to the pictures. Maybe they’d just be tickled to know that they’re still remembered so long after the ends of both their careers and their lives. Or maybe they’d seethe at the idea of being replaced, or the thought of anyone, even actresses of Sarandon and Lange’s caliber, trying to play them. (Considering how Sarandon’s Davis and Lange’s Crawford chafe anytime they’re in the presence of younger actresses in the show, this seems a likely possibility.) Feud doesn’t belittle these two grande dames of the pictures, but try as it might, it can’t help but embarrass them, either. The season finale of Feud: Bette and Joan airs Sunday, April 23 at 10 p.m.